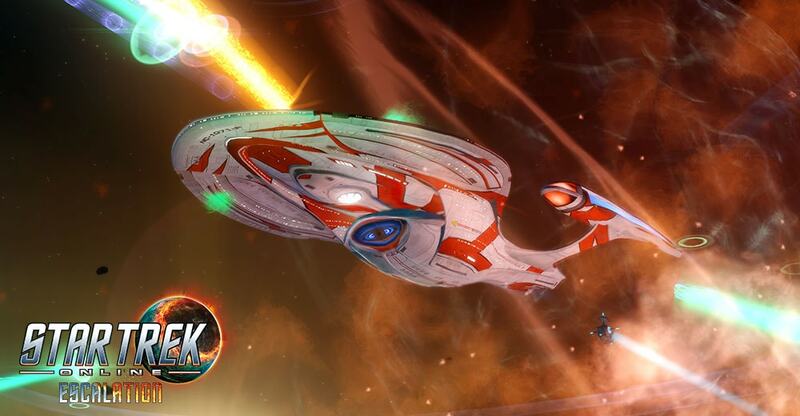 The Mirror Invasion will be returning to Star Trek Online as part of a brand new limited time event starting on Thursday, May 18th at 9AM PST, and ending on Thursday, June 9, at 10AM PST. This event map will only be playable during this three week event timeframe. In addition to earning a choice of marks for playing the Mirror Invasion queued event, players can run a new reputation project to earn a huge reward of Dilithium, Marks, and a console, Interphasic Instability! Once a day, players will be awarded a Multidimensional Transporter for playing this event. By turning in 14 Transporters through the Reputation System, players will receive 50,000 Dilithium Ore, 500 Fleet Marks, 250 Marks of Your Choice and a brand new unique console, Interphasic Instability! Technology scavenged from battles with ships from the Mirror Universe’s Terran Empire, have allowed scientists to delve into the secrets of Interphasic transitions. These findings have led to the production of a prototype Interphasic Instability Device. An Interphasic Instablity infects one enemy for a short duration. While the primary target is afflicted with the debuff, they will damage themselves over time. All nearby allies of the afflicted enemy will have their resistances lowered and their mobility impaired while also taking damage.